Panasonic PLC- FP0R series (mini) - China - Trading Company - YASKAWA. A power cable (Part number: AFPG805) is supplied with the control units. The relay output type expansion units come with a power cable (part number: AFP0581). The terminal block type relay output units have two terminal blocks (9 pins) made by Phoenix. Use a 2.5 mm 0.10 inch wide screwdriver. Preferably use the specific terminal block screwdriver (part number: AFP0806, Phoenix type code SZS0, 4 x 2.5 mm 0.10 inch) or equivalent. The connector type relay output units have two connectors made by Nihon Molex (Molex type code 51067-0900, 9 pins). Use the specific Molex connector press-fit tool (part number: AFP0805, Nihon Molex type code 57189-5000) or equivalent. The transistor output units have a press-fit socket for wire-pressed terminal cable and contacts. Use the press-fit tool (part number: AXY52000FP) for wire-pressed terminal cable. Use compatibility mode to retain existing ladder programming. You can use a DIP switch to enable compatibility mode, which allows operation at 12-bit resolution (using program resources). This unit is for making the FP0 function as a slave station of the CC-Link. Only one unit can be connected to the furthest right edge of the FP0 expansion bus. Note : Accuracy will change if an FP0 thermocouple unit is used at the same time. Specifications︰ The control unit is only 25mm, even extending to 128 points of I/O, and the width is only 105mm. The minimum size of the control unit is W25 x H90 x D60mm. In addition, the maximum can be expanded to 128 points. The size at this time is W105 × H90 × D60mm. The ultra-small form factor breaks the way people think about small PLCs. From the perspective of the installation area, it contributes to the miniaturization of the machine control panel. There are 3 ways to install it. Use up to three expansion units. No cables are required for stacking. The expansion unit can be connected directly to the control unit. The expansion unit can form a laminated system using the surface expansion connector and locking a single row of contacts without the need for special extension cables, backplanes, and the like. Whether it is an end block or a connector, simply moving the terminal part can be easily wired. The terminal block can be directly inserted without the need to rotate or squeeze (European manufactured by Phoenix) to handle wires from 0.2 to 1.25 mm2. In terms of size, it is superior to a general small PC, and combined control with the machine contributes to the miniaturization of the control unit. The control unit width of 32 points is W30mm. 2. The maximum can be expanded to 3 units and 128 points. A stack expansion method that does not require an extension cable is used. In the case of an expansion of 3 units, a width of only 105 mm is very space-saving. 3. High-speed operation with a scan time of approximately 1ms. The 500-step program can be processed in just 1 ms. 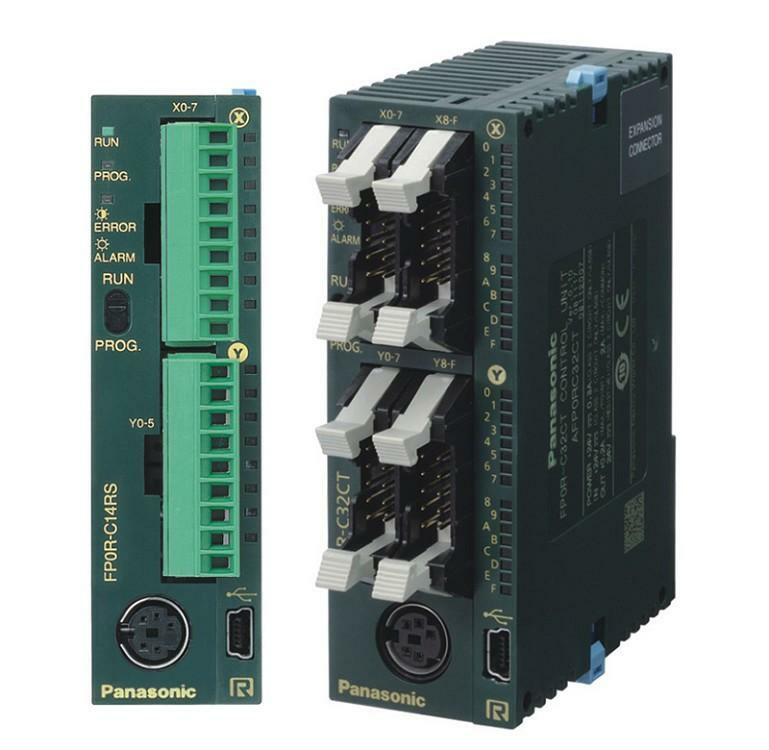 The processing speed can fully meet the needs of small PLCs. 4. Fit the terminal shape of the small body. The relay output type adopts the European terminal block method. Wiring can be performed after removing the terminal block. The mass-produced unit is equipped with a Molex connector type terminal. The standard is equipped with a calendar hanging clock and an RS232C port. The operation memory is backed up using the secondary battery.